In order to get students to think critically, you need to help them break through their mechanical thinking and manage their emotional thinking. When students think mechanically, their brains are just repeating looped recordings of thought without considering them. For example, students might have the mechanical thought, “I'm not good at math.” It just crops up in their brains whenever they look at a math problem. Often that little mechanical loop doesn't even relate to reality. 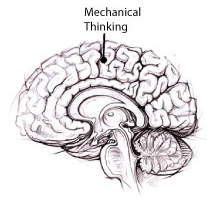 Why do we think mechanically? Mechanical thinking is useful for routine tasks like walking, riding a bike, keyboarding, driving, playing an instrument, and other activities that have become part of muscle memory. To learn any of these skills takes a lot of critical thinking, problem solving, and practice, but once the skill is learned, it is stored in the motor cortex at the top of the brain. Often a person can do something with great ease but can't explain how to do it to anyone else. The skill is no longer conscious. But to learn new skills, students need to think critically, using the prefrontal cortex at the front of the brain. How can students break through mechanical thinking? The Internet began as a U.S. military computer network meant to survive a nuclear attack. ARPANET, developed in the 1960's, stored information in a broad network of computers linked by distributed hubs so that an attack against one or more hubs could not bring down the entire thing. Wouldn't it be great if you could get your students to build the same kind of neural networks around the subjects you teach? How can you move beyond superficial, short-term learning to create learning that sticks? Modern brain science suggests one answer that you can apply in your classroom today. The brain gobbles up its external environment in bites and chunks through its sensory system: vision, hearing, smell, touch, and taste. Then the digested world is reassembled in the form of trillions of connections between brain cells that are constantly growing or dying, or becoming stronger or weaker, depending upon the richness of the banquet. By engaging many different senses, you lay the information down through multiple interconnected neural pathways, placing it in long-term memory and making it robust and "nuke-proof." 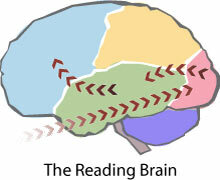 Map of the Reading Brain: Imagine that you ask your students to read a paragraph about the Treaty of Versailles. The information comes in through the eyes, imprints upon the retinas, and then travels through the optic nerves to the occipital lobe at the back of the brain. The information there is decoded into words, and impulses travel to the temporal lobes, where language processing occurs. The impulses then arc up to the frontal lobe meaning of the words is evaluated. Photo courtesy of rupjones from Flickr Creative Commons. 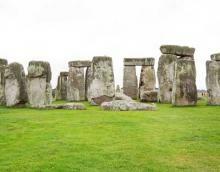 People say that Stonehenge was built to be a giant calendar that marks the winter and summer solstices. To me, that claim has always seemed a little odd. Who would spend 1,500 years building a calendar out of stone? Invent paper, people. But let’s think of a calendar in deeper terms. A calendar doesn’t just track the days of a year. It tells which days are significant and why: Mardi Gras, Passover, Tax Day, Bastille Day, Election Day, New Years. . . . More than that—a calendar tells us what we ought to be doing on these special days. It is a meeting place where we can plan our future. In that sense, Stonehenge is very much a calendar. 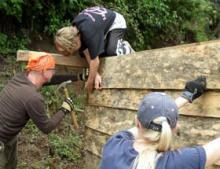 It wasn’t meant just to track time, but to provide a space for people to come together for meaningful activity. If you’re like most teachers, you’re used to thinking of your class calendar as an organizational tool that you create to guide you through presentation of the material. It’s your plan. But what if your calendar could be a meeting place? What if you invited students into the process of building the calendar—or at least part of it? As you know, group work can give teachers headaches and students nightmares. If set up poorly, collaborative projects often result in one person doing all of the work, while others contribute minimally or actually disrupt. Arguments, inefficiency, mess, and chaos follow closely. When set up well, though, group work taps into the power of collaboration. Here are 5 keys to setting up successful student collaborations. Spend a day with a small child, and you will hear many such observations. That’s because all of us have an innate human desire to teach. Somehow what we learn isn’t real until we share it with someone else. The exclamation points are almost mandatory, because we want to teach. “Show and tell” is one of the most popular times in elementary school—the chance for students to become teachers. And much of the appeal of social media is allowing middle and high school students to share what they have discovered. You’ve heard the expression, “Monkey see; monkey do.” It’s quite literally true. Great apes learn by mimicking what they see, but they don’t actively teach. Why not? 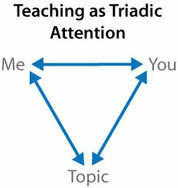 The act of teaching requires “triadic attention.” When you teach, you have to pay attention to three things—yourself, the other person, and the topic you are teaching. If you lose track of any of the three parts, the teaching moment is lost. Triadic attention is a hat trick that other species can’t maintain for long. Human beings, however, are capable of this feat even before they can speak. That’s why toddlers do so much pointing—to teach you about what they are seeing. 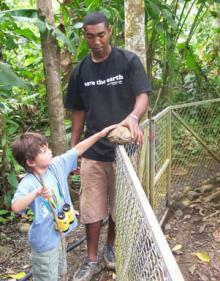 Teaching is so central to who we are that perhaps our species should be renamed Homo pedagogues. Belief that you can become smarter and more talented opens the doorways to success. That’s what twenty years of research has shown Carol Dweck of Stanford University. She has identified two opposing beliefs about intelligence and talent, beliefs that strongly impact our ability to learn. 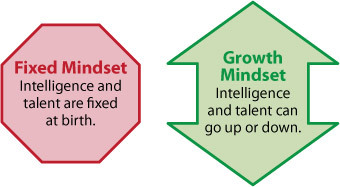 Though the fixed mindset has traditionally held sway, many recent studies show that the growth mindset better represents our abilities. Our brains are much more elastic than previously thought, constantly growing new connections. IQ and talent are not fixed, but are mutable based on experience and attitude. Wants to prove intelligence or talent. Wants to improve intelligence or talent. Avoids challenges for fear of failure. Engages challenges to improve. Gives up in the face of tough obstacles. Persists in overcoming obstacles. Avoids hard labor. Sees labor as the path to success. Treats criticism as an attack. Treats criticism as an opportunity. Feels threatened by others’ success. Feels inspired by others’ success. How can you shift your classroom away from lecture and toward inquiry? You can get help from the modern phenomenon known as crowdsourcing—the practice of putting many minds to work on a single problem. Inquiry is, in effect, crowdsourcing in your classroom. What Crowdsourcing Concepts Can Help Me? The following four concepts from crowdsourcing can help you use more inquiry in your classroom. Photo courtesy of thepurplefreak from Flickr Creative Commons. Do you know what a mouse potato is? It’s a person who spends too much time staring at a computer screen. 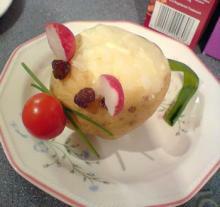 Mouse potatoes are the couch potatoes of the 21st century. In fact, Merriam Webster just added the term mouse potato to its august dictionary. Perhaps you know a few mouse potatoes. Perhaps you are one. But just learning the term mouse potato suddenly makes you think about how much time you spend in front of the computer. That’s the power of vocabulary. It enables thinking. The size of your vocabulary impacts the size of your mental world. All right, so you’re saying, “Here we go—vocabulary. It’s so elementary.” Yes, it is—as in the word element: the building blocks of everything. In fact, the origin of the word elementum is the first three letters of the Canaanite alphabet. When we talk about elements, we are reciting our Canaanite ABCs. Do you see how one word—elementary—has taken us from language arts to science to social studies? Do you see how knowing that elementum is the same as ABCs influences how we think about the Periodic Table of the Elements, about elementary school, about Holmes’s constant insistence that it is “elementary, my dear Watson”? A word doesn’t have just one meaning. It is freighted with meaning. In its prefixes, roots, and suffixes, each word stores the DNA of human experience. Vocabulary therefore shouldn’t be rote memorization. It should be inquiry. You may have never tried project-based learning, or you may teach in a purely PBL environment. Whatever your background, you’ll find that PBL can be a powerful instructional approach. Here are ten reasons why. You may have heard colleagues talk about their PLNs—their personal learning networks—or you may have one of your own. But just what is a personal learning network, and why is it so helpful for educators? Continue Reading >> about What does your PLN look like?